At the beginning of the 19th century, the territory of modern Uruguay became part of the Empire of Brazil. Then it was known as Oriental Province, or Banda Oriental. Uruguayan patriots continued the struggle for independence started by José Gervasio Artigas, who was exiled to Paraguay in 1820. The 33 Orientals were a group of exiled Uruguayan revolutionaries led by Juan Antonio Lavalleja. On April 19, 1925, they returned to Uruguay from Buenos Aires, secretly crossing the Uruguay River and landing at Agraciada Beach. There they planted a flag, which would become known as the Flag of the Treinta y Tres, and took an oath to end the Brazilian rule over Uruguay. 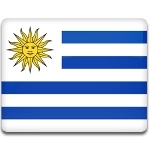 Fourth months later, Uruguay proclaimed its independence. Celebrations held on the occasion of the Landing of the 33 Patriots Day are similar to those organized on Independence Day. On April 19, solemn speeches, wreath-laying ceremonies, and special church services are held throughout Uruguay.